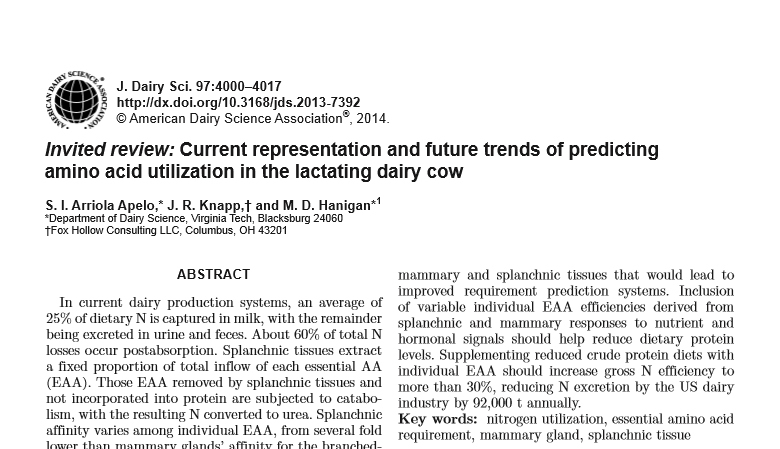 According to the Web of Science, Dr. Sebastian Arriola Apelo’s article on “Current representation and future trends of predicting amino acid utilization in the lactating dairy cow 2014” is among the 100 most highly cited papers published in Journal of Dairy Science (JDS) since the beginning of 2014. In the current edition of ISI’s Journal Citation Reports, 58 journals are ranked in the Agriculture, Dairy, and Animal Science category. In this category, JDS ranks third by Impact Factor and third by 5-Year Impact Factor. JDS continues to be highly ranked in the Food Science and Technology category as well, where the journal ranks 29th out of 128 journals in that category. To read the article, click on the following link: JDS Volume 97, Issue 7, July 2014, Pages 4000-4017.